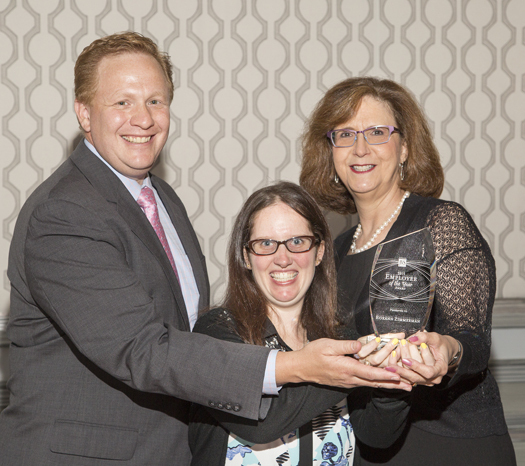 Farmington Hills resident Roxann Zimmerman was one of three individuals honored for overcoming obstacles to employment with help from JVS. Zimmerman received the Employee of the Year Award on June 11 in front of a crowd of more than 700 business and community leaders at JVS’s 18th annual Strictly Business Networking and Awards Luncheon. Zimmerman, who has a disability that affects her fine and gross motor skills, was recognized for her exceptional work ethic and positive attitude. She has worked as a store greeter for Meijer for about two years. Through the JVS supported job search program, Viviano helped Zimmerman identify her interests, talents and abilities and find a good job match. Zimmerman was first hired as a greeter at a Meijer store in Southfield, then she transferred to the Northville location. In a video prepared for the awards event, Zimmerman says she is especially proud of the independence that she’s achieved through work. See the video at jvsdet.org/strictlybiz. In addition to Zimmerman, JVS honored two other individuals with Employee of the Year Awards: Suzanne Levine, executive director of Greater West Bloomfield Chamber of Commerce, and Wayne Crowder, case manager at Neighborhood Legal Services Michigan.